I made one of my strangest birdies ever on the 18th hole at El Rio in 2006. I over-cut my tee shot, which bounced off a tree or something and ended up in the middle of the fairway, but only got as far as the junior tee, 314 yards from the green. My second shot with a 5-wood faded to the right a bit, hit the cart path, and bounced forward an extra 100 yards. I ended up dead pin-high, right of the green (yes, a 314-yard 5-wood shot!). My eagle chip just lipped out of the hole, leaving me with one of my favorite shots in golf: a tap-in birdie. On the list of Hall of Fame and Notable Golfers who have played El Rio, there's only one who I actually saw playing at El Rio with my own eyes. That was NBA basketball star Sean Elliot. He played in the group that followed mine there one day. Sean is from Tucson originally, and I was told he plays at El Rio often. One day I got paired up with a guy who was a TV sportscaster at a local station at the time and his dad. It turns out his dad was an FBI agent. That's why I'm not mentioning his name here. I was playing El Rio one day many years ago when the Navy's Blue Angels flew over the course. They were flying so low that I could see the faces of the pilots in the cockpits. There is a small lake in front of the tee box on the 6th hole. It really doesn't come into play on no. 6 unless you top your tee shot badly. I was playing there one day with a good friend with whom I've played a lot of golf over the years. My friend topped his tee shot badly. His ball skipped once off the water and struck a bird, which was sitting on the opposite bank, squarely in the head, killing it instantly. The bird was dead when it hit the ground, and it only had an inch to fall. I will always tease my friend about the "birdie" he got on that hole. This same friend had worked for Ricki Rarick, a name that figures very prominently in the history of the Tucson Open when it was played at El Rio. One day my friend borrowed Mr. Rarick's car, a Mercedes with the personalized license plates "MR GOLF". We took it to El Rio and played a round. That was fun! Another time he borrowed Mr. Rarick's other car, a 1966 Cadillac convertible, bright red with a white leather interior. What a car!!! We took that to El Rio as well. The day I shot an even par 70 at El Rio, I started with a disappointing double-bogey on the first hole. Then I started getting warmed up and managed a 39 on the front nine. Everything started going in the hole on the back nine. I took only 10 putts. The only one I missed was an 8-footer for birdie on 17. I'd made two 50-footers and a couple of 25-footers. I ended up with a 4-under 31 on the back for a total of 70. Another time I arrived at El Rio just when a light rain, which had been falling for a few hours, was stopping. There were just a few drops left as I played the first hole. The course was softer than I'd ever seen it before. The greens were very receptive. I shot a 71 that day. While those last two stories may make me sound like a low-handicapper, in all fairness, there have been many, many times I've failed to break 90 at El Rio. 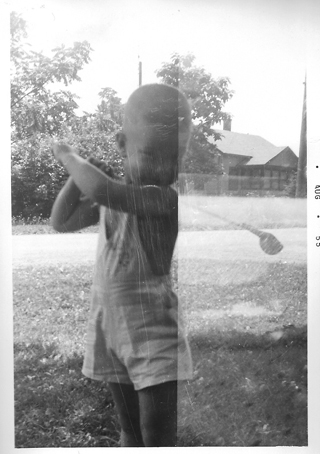 I have, however, been playing golf for a long time.